My eyes are itchy, my nose is runny and I can't stop sneezing. I can officially declare that summer is here!! Last year was my first summer as a mother but Darcy was too young to do anything much. This year I really want to make the most of my time with Darcy this summer. I want to make memories, keep her entertained and have lots of fun. I have picked activities which are either free or don’t cost too much. I know people find summer with kids stressful at times as a lot of activities are rather expensive. It doesn’t have to be if you can take time to, plan ahead, look out for 2 for 1 vouchers, check out your local council website as they advertise a lot of free activities and browse Pinterest for inspiration. 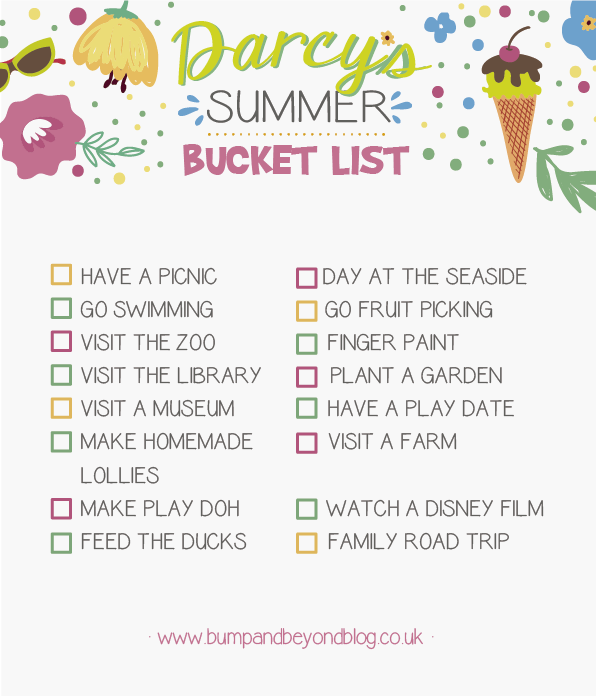 So here is Darcy’s 2015 Summer Bucket List. What is on your summer bucket list? Feel free to include your own ideas in the comments, have a great summer! !